Image caption The departing Mr Blatter said: "Fifa needs profound restructuring"
Fifa president Sepp Blatter is being investigated by US officials as part of their inquiry into corruption at the world football body, US media say. The news came hours after Mr Blatter, 79, announced that he was stepping down from his role. US prosecutors launched a criminal inquiry last week, with seven Fifa officials arrested in Switzerland, part of a group of 14 people indicted. Two days after the arrests, Mr Blatter was re-elected president of Fifa. However, he said on Tuesday that it appeared the mandate he had been given "does not seem to be supported by everybody in the world of football". Mr Blatter said Fifa needed profound restructuring, adding that he would remain in post until an extraordinary congress was called to elect a new president. No dates have been set, but under Fifa rules it is expected to take place between December 2015 and March 2016. US officials quoted in the New York Times said they hoped to gain the co-operation of some of the Fifa figures now under indictment on charges of racketeering and money laundering to try to build a case against Mr Blatter. Separately on Wednesday, Interpol issued a wanted persons alert for two former Fifa officials, Jack Warner and Nicolas Leoz, as well as four corporate executives. All six were on the list of 14 people indicted by the US authorities last week. Meanwhile, South African's sports minister has again denied that a $10m bribe was paid to secure the 2010 World Cup, which was one of the charges to come out of the US investigation. Sepp Blatter's key advisers cut dejected figures last night as their boss announced he was stepping aside. The air of despondency in Zurich contrasts sharply with that in the rest of Europe. English Football Association chairman Greg Dyke and others who have pushed for reform rejoiced at the news that the man who has controlled Fifa with an iron grip since 1998 was finally going. The question now turns to who will replace Sepp Blatter. What sort of Fifa will the winner inherit if the promised radical reforms take place? What next for the World Cup hosts Russia and Qatar? Unless the electoral process changes dramatically Asian and African countries will once again be the power brokers. Given anti-European sentiments amongst many nations in those continents the winner will need to be acceptable to all sides. With Prince Ali of Jordan backed by Uefa, could he now return and claim the Fifa crown he was denied by Sepp Blatter last Friday? Why did Sepp Blatter go now? How would Fifa officials be extradited? Earlier the FBI, Internal Revenue Service and the US Attorney for the Eastern District of New York, who is involved in the US prosecutions, all said they would not comment on the Blatter resignation. In its prosecution, the US justice department said 14 individuals were under investigation worldwide for allegedly accepting bribes and kickbacks estimated at more than $150m (£97m) over a 24-year period. Two vice-presidents were among the seven Fifa officials arrested in Zurich. They all await US extradition proceedings. Mr Blatter was back in his office at the Fifa headquarters in Zurich on Wednesday, the BBC understands. His daughter, Corinne Blatter-Andenmatten, is quoted by Swiss Daily Blick (in German) as saying her father's decision "has nothing, absolutely nothing, to do with the allegations going around". The arrests overshadowed the vote for a new president, which Mr Blatter won, defeating his sole challenger, Prince Ali bin Al Hussein of Jordan. Prince Ali withdrew despite forcing a second round, having lost the first by 133 votes to 73. Media captionPele: " What happened with the corruption, this is not my problem"
Uefa chief Michel Platini said an emergency meeting scheduled for Saturday to discuss the Fifa crisis and Mr Blatter's re-election - a move the European body had opposed - would now be postponed. Mr Blatter, who is Swiss and has been Fifa president since 1998, said he would urge Fifa's executive committee to organise an extraordinary congress "for the election of my successor at the earliest opportunity". Further allegations of corruption emerged on Tuesday with claims that Fifa general secretary Jerome Valcke was linked to an alleged $10m (£6m) payment of bribes over South Africa's bid to host the 2010 World Cup. He denies any wrongdoing. South African Sports Minister Fikile Mbalula told reporters on Wednesday that the payment was above board, aimed at supporting football in the African diaspora in the Caribbean. "We refuse to be caught up in a battle of the United States authorities and Fifa," he added. A separate criminal investigation by Swiss authorities into how the 2018 and 2022 World Cups were allocated is also under way. Australian football chief Frank Lowy said on Wednesday that the race to win the 2022 bid, which was awarded to Qatar, was "not clean" and that he had shared what he knew with the authorities. He said in an open letter that former Concacaf president Jack Warner had misappropriated funds worth $500,000 sent by Australia intended to develop the organisation's Centre of Excellence in Trinidad and Tobago. 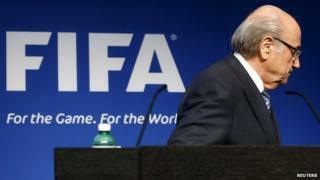 Mr Blatter's departure "should open the door to major reform," he added. The Australian government spent about $40m on its World Cup bid but received only one vote.